With two previous visits and a handful of meals that were nothing to write home about already under my belt, I had started to give up on Assisi by the time we stumbled upon Osteria Piazetta delle Erbe. Assisi might be my favorite Umbrian town to wander through. It might be a great place for a hike. It might draw hordes of tourists every year to revel in its basilicas, maze-like streets, and spiritual histories. But perhaps, I thought, Assisi wasn’t a great place to eat. It’s Italy, and so that seemed like blasphemy. But there it was. A disappointing flutter in the back of my mind. Still, we had a few more meals left to prove my thoughts wrong. And one of those meals was a lunch at our hostess’ favorite restaurant. The dining room was a mix of elegant touches—stone walls, arches, wine displayed as art—and comfortable, homey, farm-fresh decor—bright-colored wooden chairs, light wooden table tops. And being the early eaters we are, we were lucky enough to have our pick of tables. We chose one bathed in sunshine, tucked away in the front corner of the space. Of course, decor only matters to me if it’s a backdrop to excellent food. But by the time I’d tasted the amuse bouche, I knew I’d finally found something to write home about, a place that I could return to when I inevitably circled back to my favorite Umbrian hill town. The current menu starts with beef tartare, crispy artichokes, grilled octopus, and local meats and cheeses, moves on to creative risottos and pastas like red beet gnocci, and finishes with a fruit-driven dessert menu featuring apple pie in a glass and pistachio pie with raspberry sherbert. The menu changes every few months, but locals say the chef nearly always knocks it out of the park in terms of flavor and pairings. Always suckers for a good chef’s special, my partner and I chose the dish of the day: a delicately prepared young rooster served with seasonal vegetables. If it’s on the menu when you go, I highly recommend it. Go in the summer for open-air tables spread out in front of the restaurant. Do reserve in advance if you can, as it fills up fast. Hours: Lunch from 12:30 to 14:30; dinner from 19:30 to 22. Closed Mondays. In between meals, Assisi is a stunning place to explore. The old city is perched atop a hill and if you keep wandering upward, you’ll stumble upon a castle and some excellent views of the green patchwork countryside laid out around you. Wanderers will appreciate the picturesque hike down the hill to a nunnery-turned-local-goods-shop. For exceptional jams (quite possibly the best jams I’ve ever had, which is really saying something) and sausages, don’t miss the cutest food shop in the center of town: Cacio Pepe. For more things to do in Assisi, Georgette always has good suggestions and savvy local Rebecca is the one who pointed me toward Osteria Piazzetta delle Erbe. * Photos courtesy of Osteria Piazzetta delle Erbe (my own shots didn’t do them justice). Are dogs allowed in restaurants in Italy? Thanks for the shoutout and your dish looks delicious! I am actually hoping to head back to Assisi sometime soon! I love the slower pace of life there.. Yes! Assisi is definitely a favorite. We need to get back and have another few meals here. 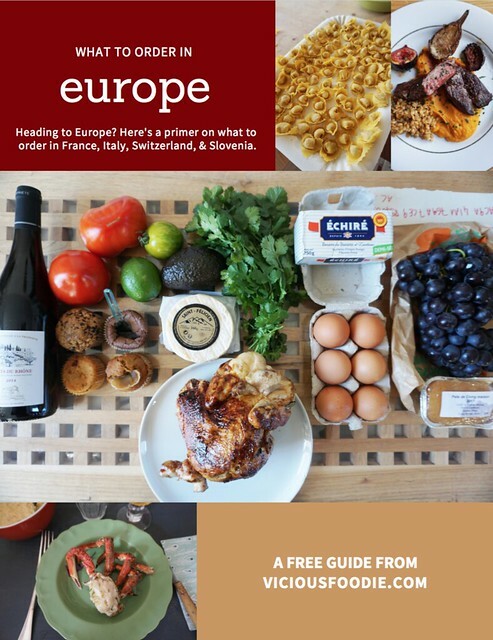 Foodie snark in your inbox + a free foodie guide. You know you want it. All rights reserved. Do not copy text or photos without permission.